There was a bit of a hatch on the lake and the bluegills and bass were rising. 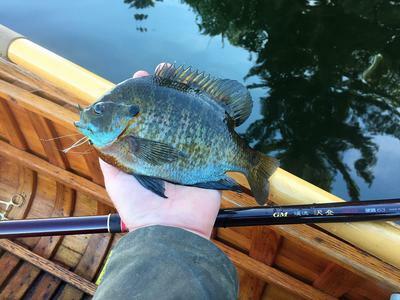 I caught at least a dozen bluegills and a couple rock bass on a rubber legged popper. Using a 20 foot #4.5 level line and a few feet of 5X tippet the Sawanobori 63 cast the popper beautifully and I could make it pop with just a flick of the wrist, holding the rod one handed. I'm really enjoying this rod. Next outing to the lake I"m going to target the smallmouth and pike! Here's a photo of my first Sawanobori fish. I can tell you the rod works very nicely on smallmouth bass!